As you add or import transactions into Wave, the Review tool helps you stay on top of the work you need to complete on the Transactions page. We’ve made some language changes to help ensure ease and clarity while you work. Now, when you click on the checkmark to the right of any transaction on your Transactions page, it will be marked as Reviewed. 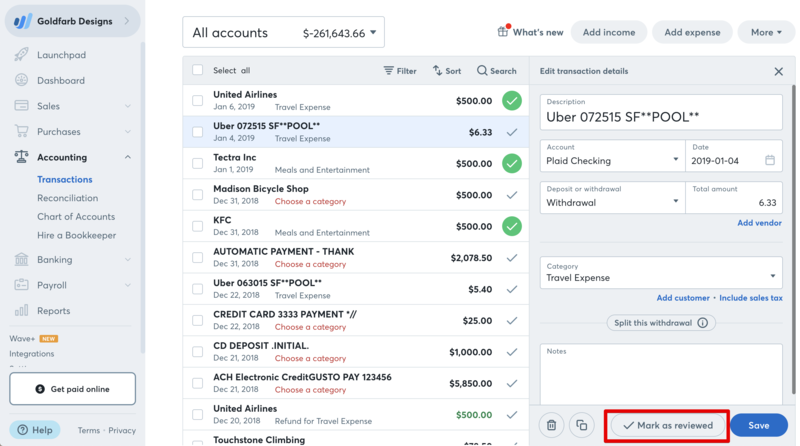 You can also mark transactions as reviewed in the details panel for any transaction. Previously, this function was called Verification. We’ve made this change to more accurately reflect what you’re actually doing: when you Review a transaction, you are indicating that its details are correct and you’ve finished working with it. You can un-review a transaction you previously reviewed by clicking the green checkmark next to it. Consider any unreviewed transactions on your transactions page as a kind of to-do list. Regularly review, and you'll know you're on top of your books!